Danny Peterson | 3/6/2018, 5:15 p.m. The idea of arming some teaches with guns as a response to the rising number of school shootings across the country is drawing a rebuke from community leaders, including the union presidents of Portland’s police officers and public school teachers. Daryl Turner, the president of the Portland Police Association, said that such a move would pose serious risks and likely add to the chaos and confusion during a school shooting. “In an active shooter incident, having teachers running around a school with guns while law enforcement enters the building could make it difficult for us to differentiate between the good guys and the bad guys. It would increase the risk of innocent people—children, other teachers, and police officers—being injured or killed,” Turner said. 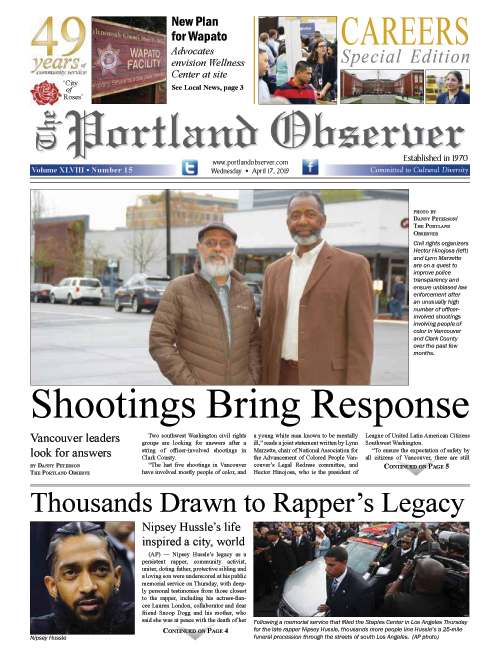 Portland Association of Teachers President and educator Suzanne Cohen told the Portland Observer Tuesday that arming teachers still operates under the assumption that mass shootings in schools and other public places is considered normal. “When I was a kid in school, we didn’t practice hiding in closets. When I started my teaching career, we didn’t have these drills,” Cohen said. Cohen said that instead of arming teachers, assault rifle bans and common sense legislation should be put in place to mitigate tragedies in the future. President Trump and the National Rifle Association are calling for arming pro-gun teachers in response to the mass shooting at a high school in Parkland, Fla. where 17 were killed with an AR-15, semi-automatic assault rifle last month. ABC News also reported last week that a recent study conducted from the National Bureau of Economic Research discredited the “good guy with a gun” solution to gun violence. It showed that, in states that had laws allowing citizens to carry handguns, an increase of 13 to 15 percent in violent crimes occurred by the 10th year. A study conducted by the FBI in 2014 also showed that, between the years 2000 and 2013, most civilians who safely stopped a mass shooter were unarmed. Turner, who also represents a bi-partisan law enforcement advocacy group, calls on lawmakers to ban gun modification equipment that can make weapons more deadly, enhance sentences for those who commit mass shootings, and enforce existing gun laws.